This was my knife submission for the LJs 2017 Knife Swap. I wasn’t really sure what would be appropriate for this swap. However after pondering it for a while, I thought it might be nice to have a dedicated knife to keep by the BBQ. So this is what I went about making. Having been sent some nice figured eucalyptus from KelleyCrafts and turning a pen from it, I knew the eucalyptus was what I wanted to use for the handle. I also thought some ebony would set it off nicely. 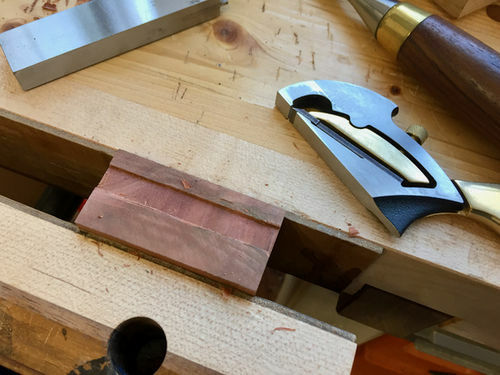 The blade has a hidden tang and the handle is pinned with two brass rods. 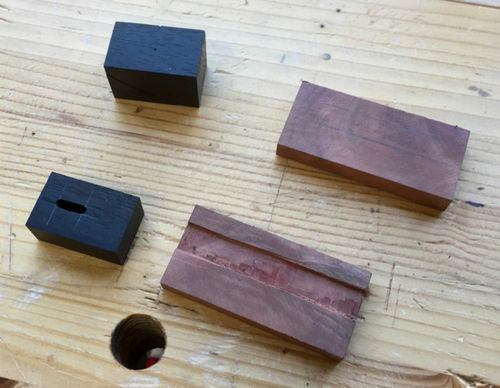 The block was formed from a piece of wenge. The handle and block are finished with a few coats of home brew BLO and bees wax. Unfortunately I didn’t forge the blade as I think it would have been way above my pay grade. 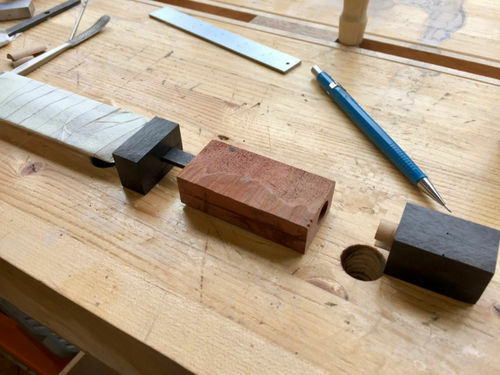 But I thought the process of how I made the handle would be of interest to some, which is shown in the pictures below. 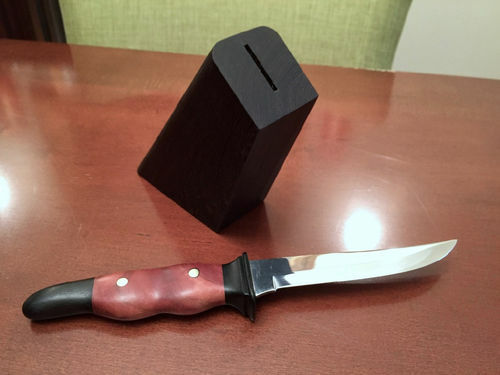 That’s a darned pretty knife you made, Bill. And it’s interesting to see the pictures of how you tackled it. I think you picked a knife blade shape that is very suitable to many situations and looks great. 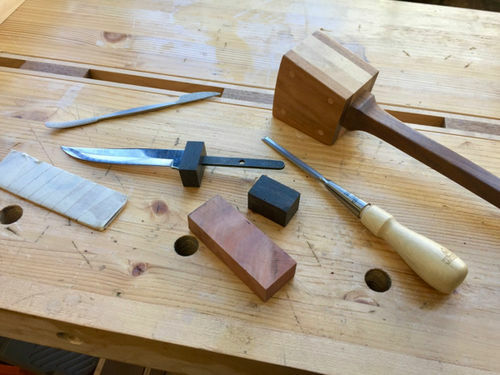 The handle and bolster are shaped very thoughtfully and combined with the block are just stunning and well executed. Great build Bill! Your knife, sir weel keel! :-) Really beautifully executed! love the double color and the shape of it Bill. You did fine work on it buddy … kudos !!! 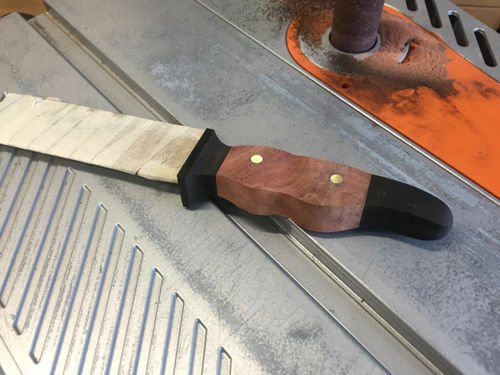 Bill you made a beautiful knife! Wonderful choice of woods and shape. Thanks for taking part in the swap! I realize I didn’t post a pic of what the hidden tang looks like. So here it is. lucky guy that got that knife its beutiful.love your choice of wood and shaping,should feel good in the hand.great job. This is a beautiful knife and so nicely. That’s an awesome looking knife! Beautiful work! A work of art. Amazing job! Thank you Larry, Charles, Jeff, Tony and AJ. Jeff I didn’t plan in pinning the tang. 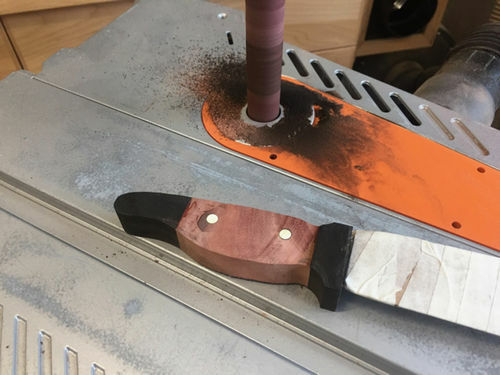 But after considering it again, I wasn’t sure I wanted to rely on just the epoxy to secure the blade for long term use. Three pins would have been too many for the size/length of the handle. 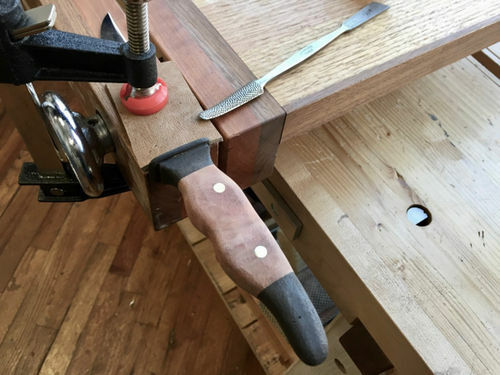 After laying out and drilling for two, I saw how the shape of the handle needed to be adjusted. 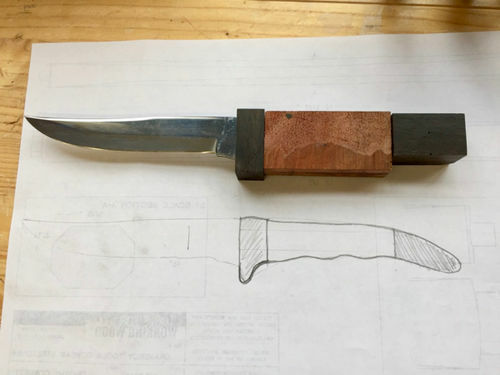 This also allowed for a more hefty and substantial handle, which seemed appropriate for a block knife as opposed to a steak knife that’s part of a set.